When Eric Boguniecki of West Haven was a prep-school hockey star in the early 1990s, his in-state college options were, well, Yale. He went to play four years at the University of New Hampshire. "For me, coming up, it was Hockey East," said Boguniecki, now an assistant coach with the Bridgeport Sound Tigers after a long pro career. Quinnipiac, Fairfield (which dropped its varsity program in 2003) and Sacred Heart were Division III programs at the time. He looked at the Boston schools, at Maine. Two decades later, it's a different picture. Yale is in the midst of its most successful stretch in school history. Quinnipiac, ascendant, is the No. 2 college hockey team in the country after a long stretch at No. 1. UConn is a couple of years away from joining Hockey East, one of the power conferences. The Huskies' current cohort in Atlantic Hockey, Sacred Heart, had a rough season but is only three years removed from an appearance in the conference final. "It's an unbelievable scene," Sacred Heart coach C.J. Marottolo said. "Sacred Heart, Yale, Quinnipiac, 25, 30 minutes away. An hour up the road, there's UConn. It's a pretty nice packet of schools. It's great for the hockey fan in Connecticut." Yale's two meetings with Quinnipiac sold out, first at Ingalls Rink and then at the TD Bank Sports Center in Hamden. "Rivalry is probably one of the most important parts of sports," Quinnipiac athletic director Jack McDonald said. "Yankees-Red Sox. Ohio State-Michigan. USC-UCLA. Cubs-Cardinals. You can go on and on with the great rivalries of sports. "Quinnipiac and Yale was the hottest ticket in the whole state of Connecticut. Deference to the other local colleges, but for in-state rivalry, there's nothing better." Particularly with UConn's impending jump, coming up for the 2014-15 season, Connecticut's Division I hockey presence has never been stronger. What remains to be seen is how that may affect the game at other levels in the state. The online rosters of this year's 59 NCAA Division I teams included 32 players with Connecticut hometowns. Their histories varied. Quinnipiac's lone home-state player, Jordan Samuels-Thomas of West Hartford, began his college career at Bowling Green. Some went through prep schools; some through junior. Pat Busillo, a sophomore forward at UMass, has one of the more unique trips: He played four years at Sheehan, a Division III CIAC program, before going to the Hartford Junior Wolf Pack and on to Amherst. There were three Connecticut players on Sacred Heart's roster (one, goalie Alex Vazzano of Trumbull, sat out this year after transferring from Vermont). Boston College was the only other school with three, including Milford's Colin Sullivan, a Montreal draft pick who was once committed to Yale. There were also three Nutmeggers in the conferences that are mostly based in the Midwest and beyond, the Western Collegiate Hockey Association and the Central Collegiate Hockey Association. The rest are fairly evenly split among Hockey East, Atlantic Hockey and the ECAC. A major shift out west was part of the reason UConn is on the move. Penn State's move up to Division I led the Big 10 to sponsor a hockey conference. The remaining WCHA and CCHA teams realigned themselves, with Notre Dame moving to Hockey East. UConn was chosen to join them, set to face the likes of Boston College and Boston University. Had the Huskies been a Hockey East program in 1993, might Boguniecki have looked there instead of two states away? "No question," Boguniecki said. "I think for all players, if they can stay close to home, play in their backyard, it's definitely intriguing." The Huskies were in the Atlantic Hockey semifinals Friday night in Rochester, potentially two wins away from the NCAA tournament. They'll have some building to do to compete with the top schools. McDonald said UConn was particularly supportive of Quinnipiac when the Bobcats moved to Division I in 1998 (the same year as Sacred Heart), and then up from Atlantic Hockey to the ECAC in 2005. The Bobcats are ready to return the favor. "As they've proved with basketball and football," McDonald said, "UConn can be very successful." The state's college hockey isn't necessarily a zero-sum game. Competition from Yale pushes Quinnipiac to get better; Sacred Heart wants to follow in their footsteps. And a successful UConn program could boost interest even further. "Kids are going to want to go there," said Sean Backman of Greenwich, who played at Yale and is now a Sound Tiger. And when it comes to competition, Marottolo looks to Boston and sees one possible future for Connecticut hockey. For 61 years, the four big Boston schools -- Boston College, Boston University, Northeastern and Harvard -- have played the Beanpot. The semifinal matchups change every year in front of a sold-out TD Garden. They play the final a week later in front of another sellout. What if UConn, Quinnipiac, Yale and Sacred Heart did the same thing every year? "I think it'd be a tremendous event in Connecticut," Marottolo said. "Connecticut is a hockey state. "Call it the Connecticut Cup, for lack of a better word. If a kid goes for five, six, seven, eight, 10 years? `I want to go to one of those schools.' That's what happens with the kids in Boston." Sacred Heart suffered through a 2-30-4 season, though Marottolo is hopeful for the future. They're the one state program without their own arena -- they play mostly out of Milford Ice Pavilion, with several games at Webster Bank Arena. "The first step for us is we have to start competing at a better level within our league," Marottolo said. "We're canvassing North America for the best possible student-athletes to Sacred Heart." As a member of the staff at Yale for over a decade, he saw first-hand how the facilities can help a program. 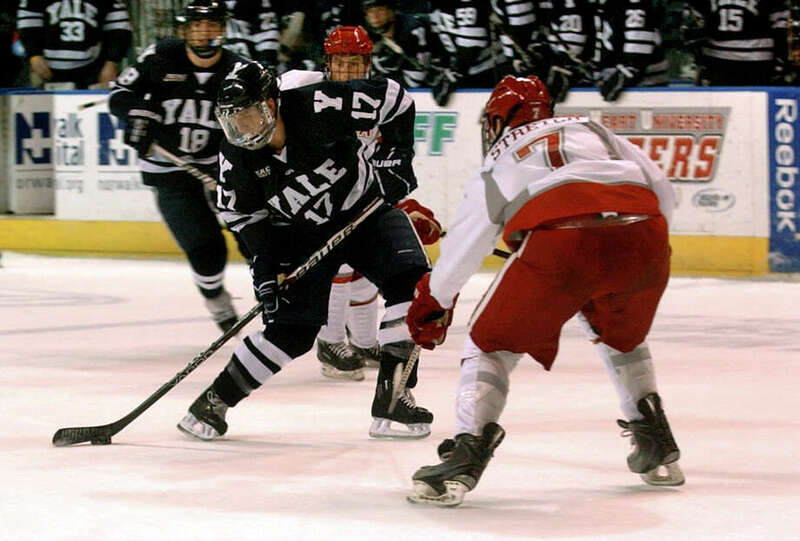 A major renovation to Ingalls Rink, he said, was part of Yale's rise to where it has qualified for three of the past four NCAA tournaments and won two ECAC tournaments since 2009. It's not so much the public experience at Ingalls; there, it's still bench seating, with the same unique Eero Saarinen geometry. The transformation is underground, the team's facilities and weight room. "It really sells the kids: `You're going to get better here,' " Marottolo said. "`You're not sharing a weight room.' It's their space. That sells kids. The lifeline of any hockey program is recruiting. We were very fortunate enough to get some kids who made an unbelievable difference." They've helped create a competitive culture on Sachem Street. So, too, have the Bobcats, a town away. "It's been a very steady progression by doing it the right way," McDonald said. "It has not been too fast." ECAC coach of the year Rand Pecknold and the administration have, McDonald said, "developed a solid program, a good name, a good schedule, most recently good facilities (the 6-year-old TD Bank Sports Center), and, most importantly, strong academics." And UConn's rise lurks behind all of them. The Huskies' on-campus Freitas Ice Forum has a capacity under 2,000, so they plan to play conference games at Hartford's XL Center. "If you're a hockey player, you go to games, you're seeing that college atmosphere: It's a goal," Boguniecki said.